Nothing like waking up on a Saturday before Christmas to the phone ringing instead of the jingle-bells of the Christmas Holidays. I recieved calls from people wanting to know why we filed an “Emergency Motion for Preliminary Injunction” against Algonquin Township. Oh the “joy” of Social Media! 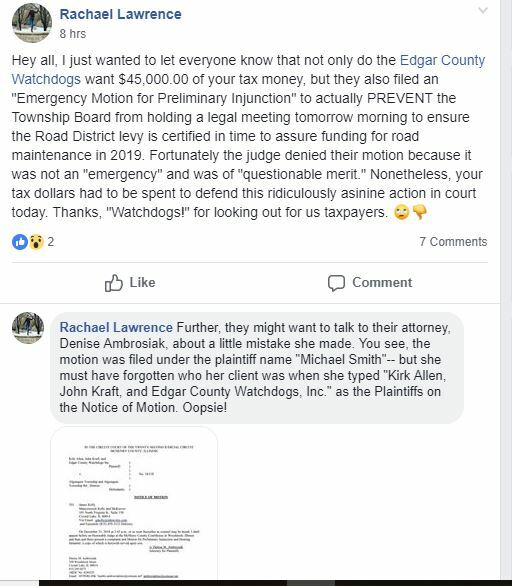 Sure enough, Algonquin Trustee Racheal Lawrence posted what we consider a slanderous lie on Facebook that we had filed an Emergency Motion for Preliminary Injunction. She went on to complain about tax dollars having to be spent on the matter, falsely insinuating it was our fault. She then chose to post a “Notice of Motion” with our personal names and company name on it, which is not an “Emergency Motion for Preliminary Injunction”. The Notice of Motion she shared was, in fact, a clerical error and at no time was any Emergency Motion for Preliminary Injunction filed against the Algonquin Township that names us as the Plaintiff. Even the docket entry reflects the Plaintiff’s name but even that fact eluded Trustee Lawrence. A fact that anyone could have found on the Circuit Clerks’ website. But what is more interesting about her slanderous lie is the fact all she had to do is ask the Attorney for the Township, James Kelly, a simple question; who filed the Emergency Motion? She would have known it was not us as she falsely claimed. Instead, it appears she chose to slander our good name with false information in her original social media post. I spoke with our attorney this morning and obtained a copy of the Emergency Motion for Preliminary Injunction and it is crystal clear, we did not file it as Lawrence claimed. Had Trustee Lawrence done even the smallest amount of research, such as checking the circuit clerk website, talk to her attorney, or simply get a copy of the actual motion she lied about, she would have known we had nothing to do with it. A copy of the actual motion filed can be downloaded at this link or viewed below. The “Notice of Motion” she later talks about is an entirely different document and she knows it mistakenly had our names on it. The Notice of Motion is nothing more than a motion to alert the courts that an actual legal motion is going to be filed that day that is going to need to be heard. Even after informing her of the lie she continued to insist she did not lie and posts more misinformation. We are confident our attorney will deal with this matter appropriately.